The Android-based Amazon Firestick and Fire TV are popular devices for Kodi fans to take advantage of. Not only do you get all the channels and functionality of Fire TV, Kodi opens up a whole new range of add-ons and streaming channels. You can install Kodi on Firestick and Fire TV devices and enjoy the same streaming experience pretty without the hassle of a larger device. While many Youtubers and eBay merchants sell Amazon Firesticks and Fire TVs with Kodi-pre-installed, we recommend you steer clear of these and install Kodi yourself. Those pre-configured “piracy boxes” often contain malware and malicious add-ons that steal your data, inject advertisements, or use your device as part of a larger botnet among other nefarious activities. 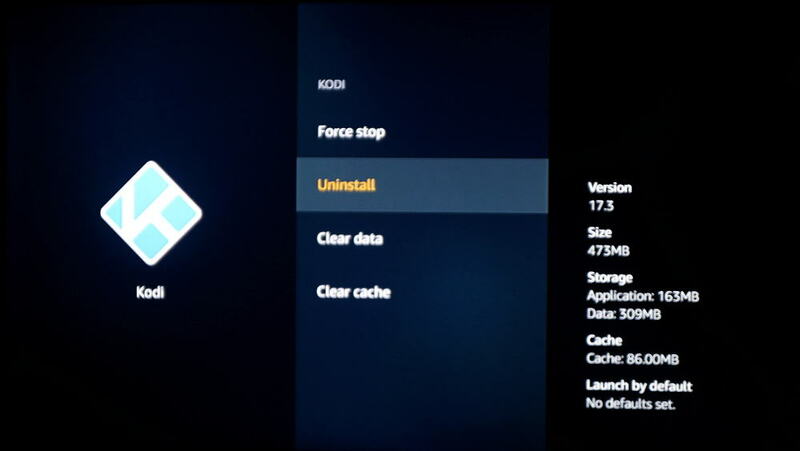 The process for installing Kodi on a Fire TV is the same as for a Firestick. Both devices, so long as you are using the 2nd-generation Fire TV Stick or newer, use the same Android-based Fire TV operating system. 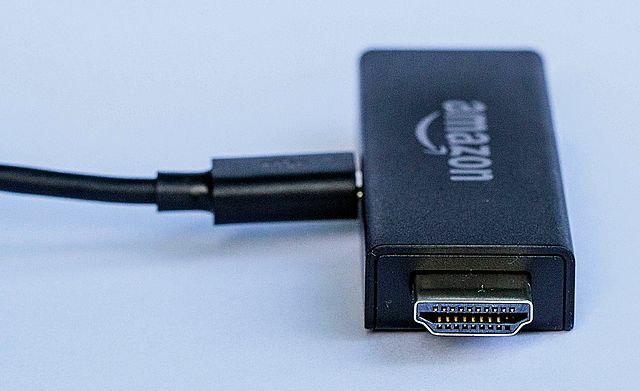 Note that the Fire TV has more powerful hardware and the storage can be expanded with an SD card, so it will run Kodi faster than the Stick and allow you to download more content. There are several ways to install Kodi on a Fire TV, three of which we’ll outline here with step-by-step instructions. There are other methods using ADB and other tools, but frankly, they are overly complicated. One of these simple methods should get you up and running much faster. Once Kodi is ready, you can start installing add-ons like USTVNow just as you would on any other Kodi device. Before we begin, we need to allow the Fire TV to install apps from unknown sources. You can now use apps from outside Amazon’s app ecosystem, including Kodi. While using Kodi, you should employ a virtual private network or VPN to keep you safe online. For some streaming, you will want to unblock geo-locked content or hide your streaming activity from snooping ISPs. Additionally, some third-party Kodi add-ons and builds can be hijacked by hackers, leaving you and your computer system exposed. The best way to avoid these situations is to install a VPN. We highly recommend everyone connect to a VPN before streaming or downloading content on Kodi. Short for virtual private network, a VPN encrypts a device’s internet traffic and routes it through an intermediary server in a location of your choosing. This provides you with a new IP address and masks your internet activity from your ISP, making everything you do online more private. You will need a VPN that is fast, takes your privacy seriously and has no data cap. We recommend IPVanish which fit’s these criteria, is the most popular VPN with the Kodi community, works with all Kodi add-ons and is one of the more straightforward VPNs to install on a Fire Stick or Fire TV. DEAL ALERT: Our readers can save 60% on an IPVanish annual subscription here or 36% on the monthly plan. Learn how to install a VPN on an Amazon Fire Stick or Fire TV in this tutorial. While there are several ways to install Kodi on a Firestick this is by far the easiest. It doesn’t require a second device or a file explorer app. 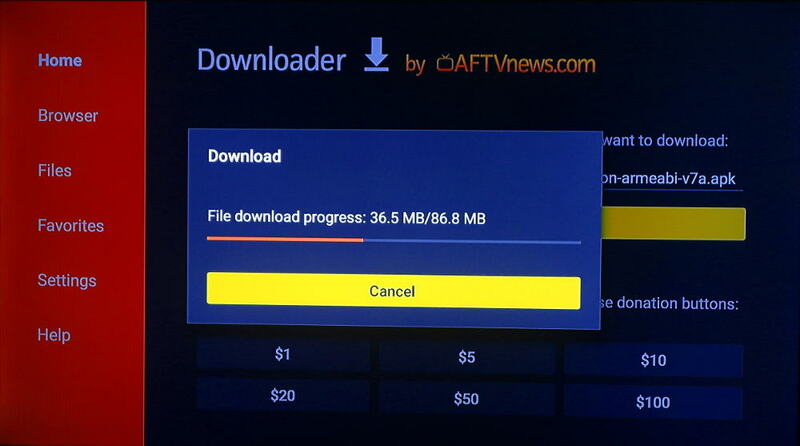 Instead, we’ll use the Downloader app to get Kodi directly from the official website. It works will all versions of the Fire TV and Fire TV Stick, including first-generation models. You can launch Kodi from the Apps section of the main Fire TV menu. Make sure to turn on your VPN first! The link we provide (https://www.comparitech.com/go/latest-kodi/) is a redirect URL that always points to the latest stable version of Kodi compatible with Fire TV. For convenience, it’s much easier to type in that URL than the official one on the Kodi website, but it leads to the same APK file. If for some reason the Downloader app in method #1 doesn’t suit you, ES Explorer is a tried-and-tested download that works in a similar manner. 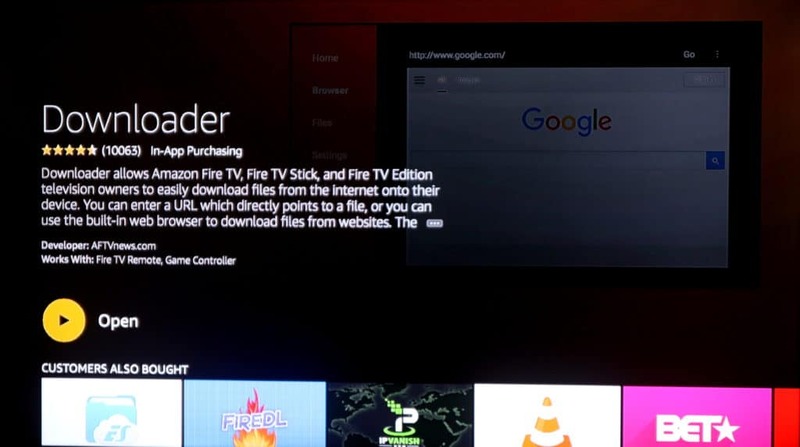 If you prefer to get the latest version of Kodi from Google Play instead of a direct download APK, and you have another Android device with access to Google Play lying around, you can use Apps2Fire to install Kodi on your Fire TV. While many users will get along fine with stock Kodi on Fire TV, others might prefer to forego the work of installing all the add-ons and repositories needed to stream the content they want. An easy way to hit the ground running is with a Kodi build with all of your favorite add-ons pre-installed. We preface all Firestick Kodi builds with this warning: While you will get some good, legal content and add-ons with a build, you may also download and install blacklisted add-ons as well. Kodi builds come with a large number of add-ons pre-installed, and you cannot select which ones you receive. A build can be useful by providing new and interesting features to Kodi, but you will need to do your due diligence to ensure you delete the unwanted piracy addons before you use it. If you’ve already got Kodi for Firestick installed and want to try a new build, make sure you perform a fresh install first. This simple build comes with an interface that resembles the official Krypton version of Kodi. Taking up only 204MB of space on your Fire Stick, the build nets you live and on-demand TV, movies, sports, and kids content. Content is accessible directly from the home screen. It comes with an add-on installer, which makes it much easier to install more of your favorite add-ons without a keyboard. At less than 100MB, Horus is a tiny Kodi build designed to run on less powerful devices. It’s extremely quick and supports all of your favorite add-ons, including Exodus. The interface is minimalist, links are up-to-date and the menus are well-organized. The Echo Wizard feature gives you access to community builds and special advanced settings. A bar above the main menu shows how much of your system resources are being used in real time. Fire TV Guru caters specifically to Fire TV and Firestick users. It comes with several popular add-ons pre-installed and includes categories for live and on-demand TV shows, movies, sports, and kids. An adult content option is available in the setup wizard. The developers say the build should run well on Fire Sticks without much lag. Wullies Mini is resource-light and its 142MB file size fits nicely onto an Amazon Fire TV Stick. Not only that, it deletes unnecessary files each time you launch Kodi to keep the build as lean as possible. 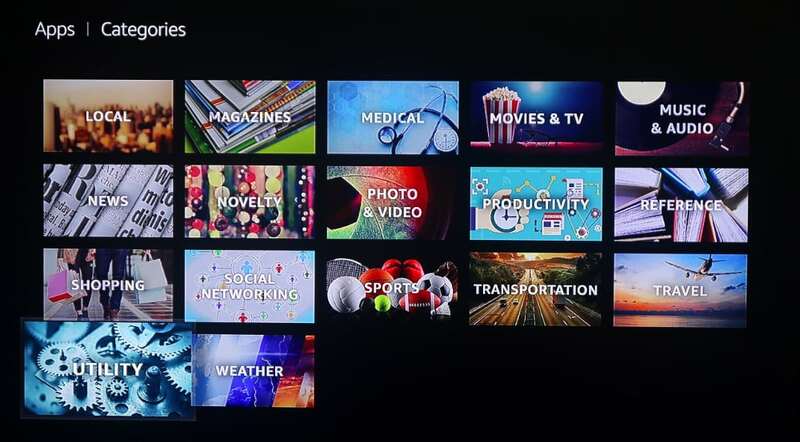 You also get categories to browse like sports, movies, TV shows, comedy, music, and live TV. Aqua is a lightweight build with a pleasant underwater theme. The community wizard allows you to install the build without wiping the old one first. You can set how often you want the wizard to clean out Kodi to keep it as lean as possible. Supports Realdedbrid, Trakt, and Favorites. There’s also a special motorsports section just for racing fans. Updating to the latest version of Kodi on Fire TV Stick uses the exact same process as a fresh install with method #1 above. Just change the download URL to the latest version from the official Kodi website. 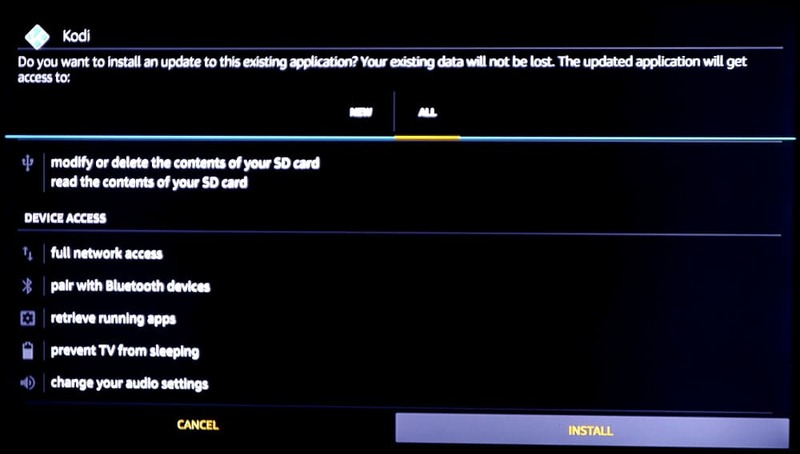 When you are prompted to install the update, you’ll be shown any new permissions that Kodi asks for. That being said, there are a couple prerequisites to make sure everything goes smoothly. If you’re upgrading from an older major version of Kodi and not just an older minor version build, such as from Jarvis 16.1 to Krypton 17.4, we recommend a clean install. That means uninstalling the existing Kodi app before installing the new one. More on how to uninstall below. If you have a skin other than the original, we recommend switching back to the original skin first. Not all skins are compatible between different versions of Kodi, and updating with one in use could cause issues such as a black screen. The original skin is called “Confluence”.